I needed something to use as a base for my bowl, so I decided to use an old world globe from Goodwill. It was taken apart so that I had two halves of the world. 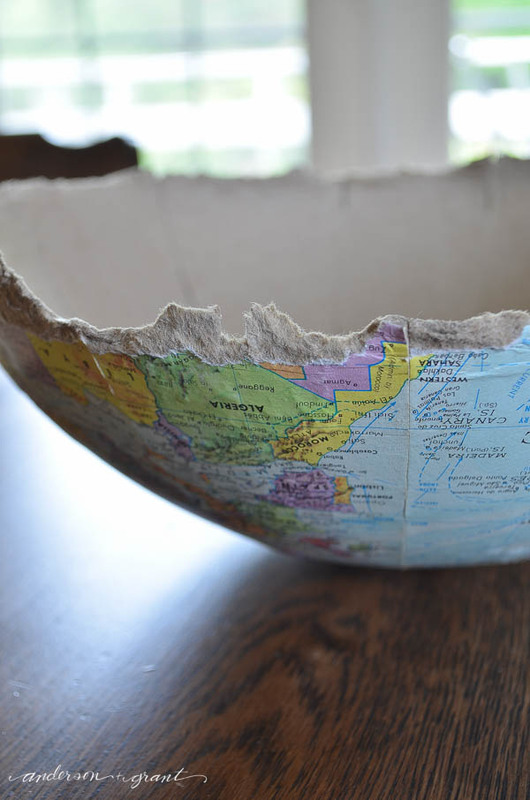 The half a globe was too deep for my taste and I wanted my bowl to be a little rustic, so I cut down into the globe and tore apart sections to make it shorter. 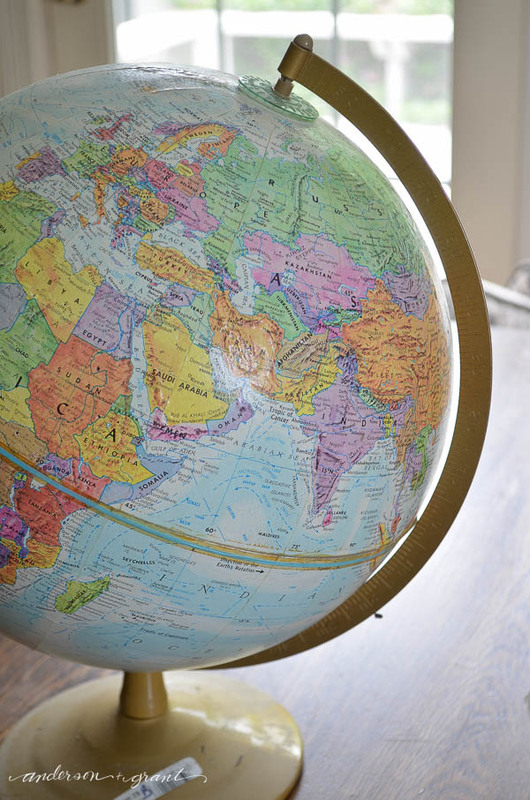 The cardboard globe is really thick and hard to cut, so that is how I ended up tearing it apart. But this gave me a rustic look, which was exactly what I was looking for. One the globe was cut down in size, I pulled apart layers of the cardboard to make the edges wider for the next step in this process. This project uses one of my all-time-favorite craft products.....joint compound. Yes, I realize that joint compound is not a craft product but rather a home improvement product, but I like to think out of the box. 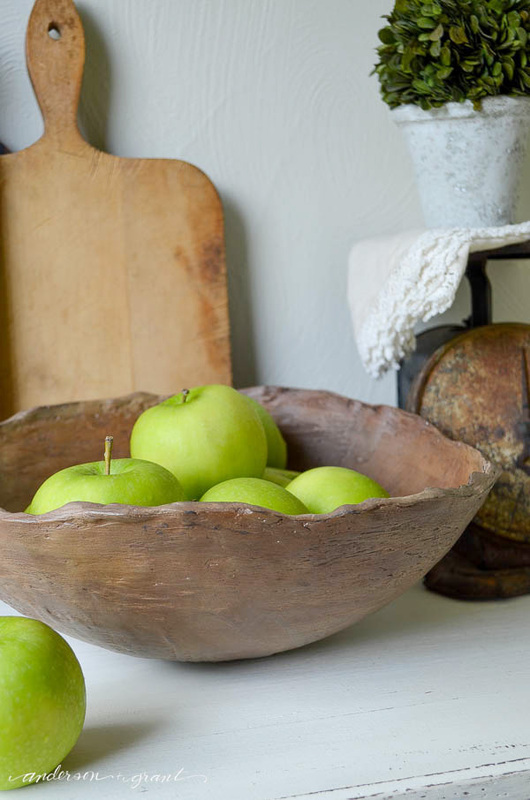 I've used it on a few different projects in the past, and it worked perfectly to make these bowls. 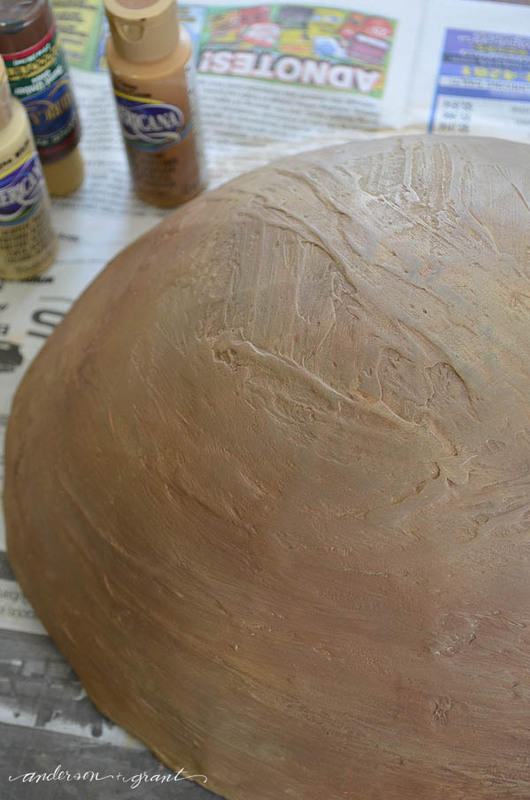 The inside and outside of the globe will need two coats each of joint compound. The first coat can just be layered on without worrying too much about things being smooth. This coat will develop a good base. Smooth it on as though you are frosting a cake. Try not to get it any thicker because it will take too long to dry. 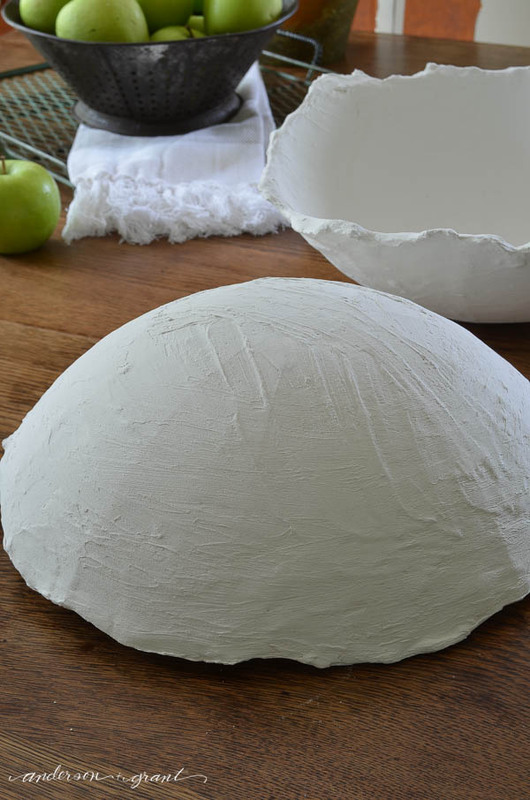 Add more around the edge of the bowl and into the sections you pulled apart because dough bowls are typically thicker than the width of the globe. The joint compound will soak down into the globe and dry pretty quickly, allowing you to do both the inside and outside coat in not a lot of time. Allow a day for the first layer to dry completely, and then repeat the process. Again, be sure not to put it on too thick. This time, however, try to smooth the layer out a bit with your hands and fingers to simulate the look of a wood grain. It doesn't have to be perfect. 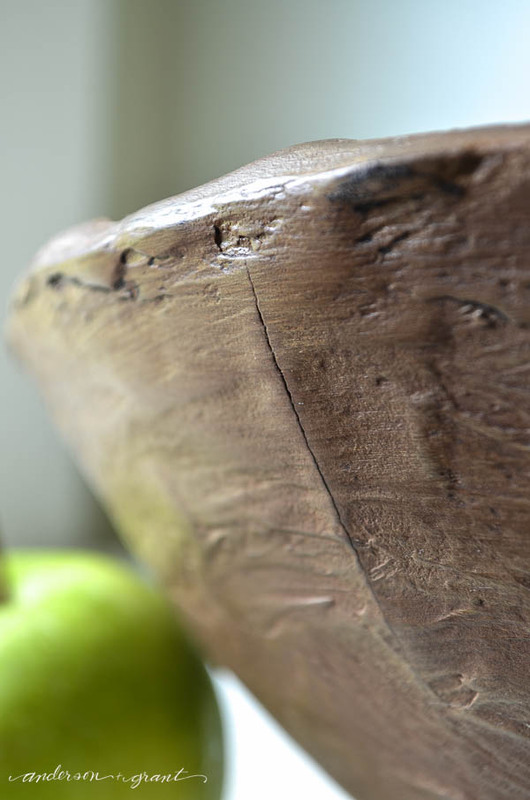 Allow the second coat to dry and then give the entire bowl a light sanding. 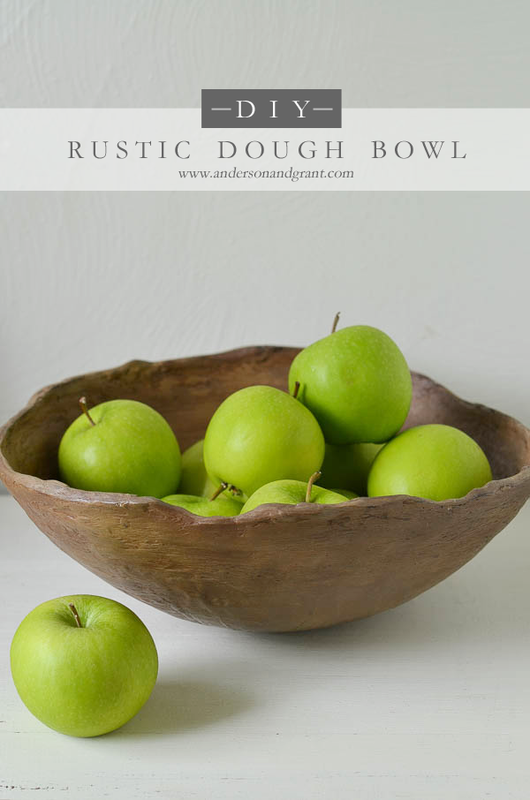 This will knock down a lot of the imperfections and make the bowl look more like rustic wood. While that portion of the process is pretty messy, it goes quickly and isn't too difficult. The painting portion can be a bit more intimidating, but you seriously cannot mess it up. Just keep layering on paints until you get the look you're going for. The brand of craft paint I used for this project was Americana, but you can choose your own brand and shades if you'd like. I started with a base of burnt umber over the entire bowl inside and out. 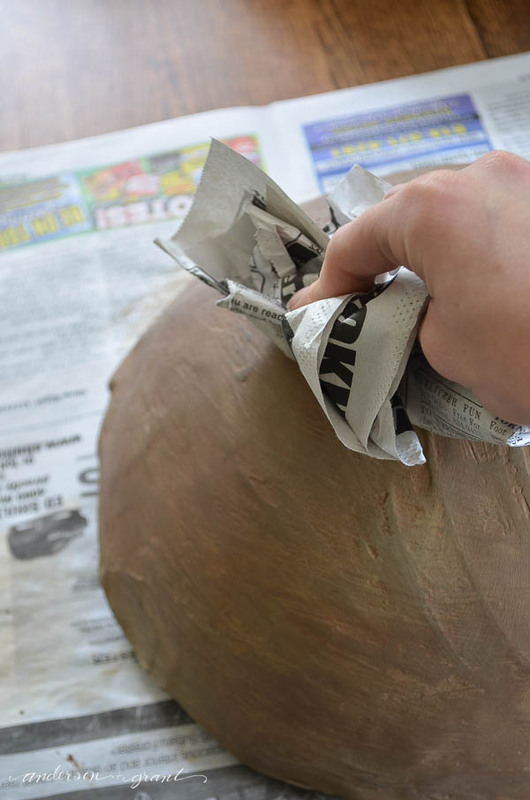 You'll need one coat and it will soak in really quickly allowing you to paint the whole piece without any dry time. Then I dry brushed on cocoa, which is a golden brown color. You don't want too much paint to go on at a time. If you happen to get more than you can smooth on, dab your brush (or your finger) in a little water to thin everything out. My final coat was antique white (which is more of a tan color). The same steps can be followed with this coat. The whole painting process is really a lot of trial and error. I'd lighten a few areas up by using more antique white....and then darken other areas using a bit more burnt umber. As long as you remember to not put much paint on your brush at a time you can keep building up the color to look like real wood. You'll get the hang of it as you try working with the paint. This next step happened by accident as I was painting on newspaper. I noticed that it left black residue on the bowl that actually made the faux dough bowl look like it had been naturally aged. So when the paint was dry, I rubbed newspaper over the entire bowl. Then the bowl was sealed with an acrylic craft sealer (or polyurethane) to protect the paint. 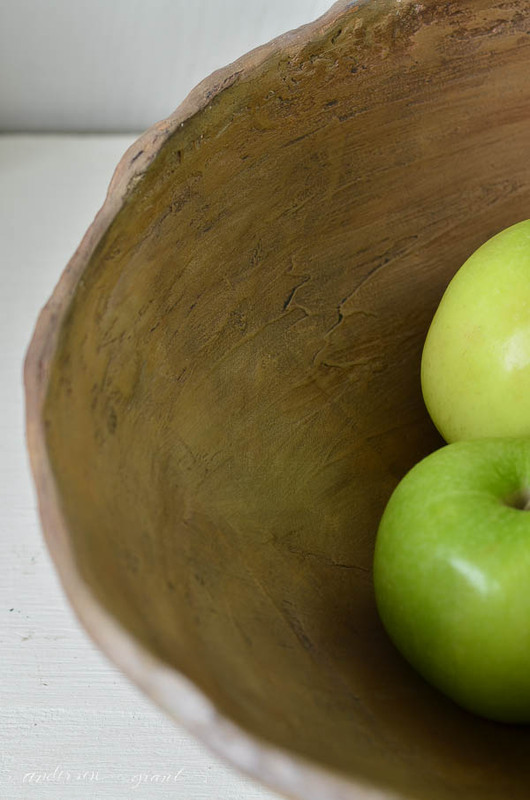 And finally I used Miss Mustard Seed's antiquing wax over the bowl to add a little depth and age. This is a bit more difficult than the majority of the projects I've been posting lately, but I absolutely love how it all came together. It really does look fabulous holding some apples on the counter top. The multiple layers of paint really eliminate the chalkiness of the joint compound and with the addition of the sealer the paint holds up really well. Be aware, though, that if you drop the bowl of the floor, you will get some cracks! Speaking of cracks.....I mentioned not to get the joint compound too thick or it will crack. If it happens, those cracks can be filled in with more compound. 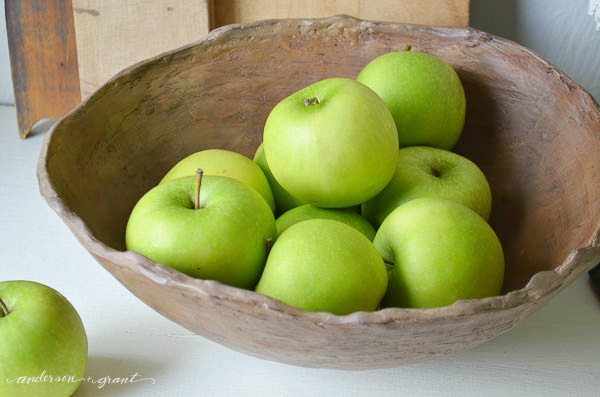 I choose to leave a few, though, because I think that it just makes the bowl look a little more real and rustic. I hope you are willing to give this project a try. 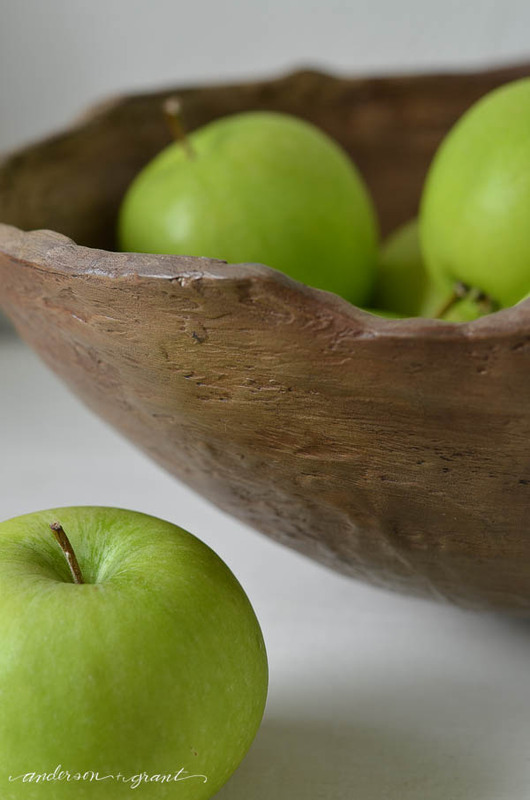 Experiment with what you use as a base....try a plastic bowl or container. 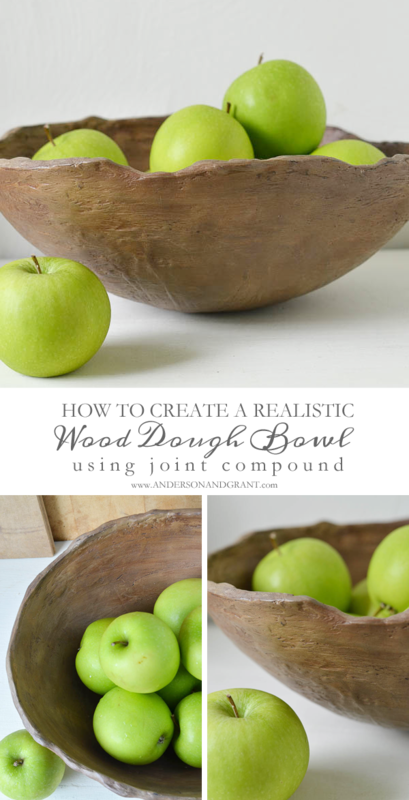 Make a long bowl rather than a round one. 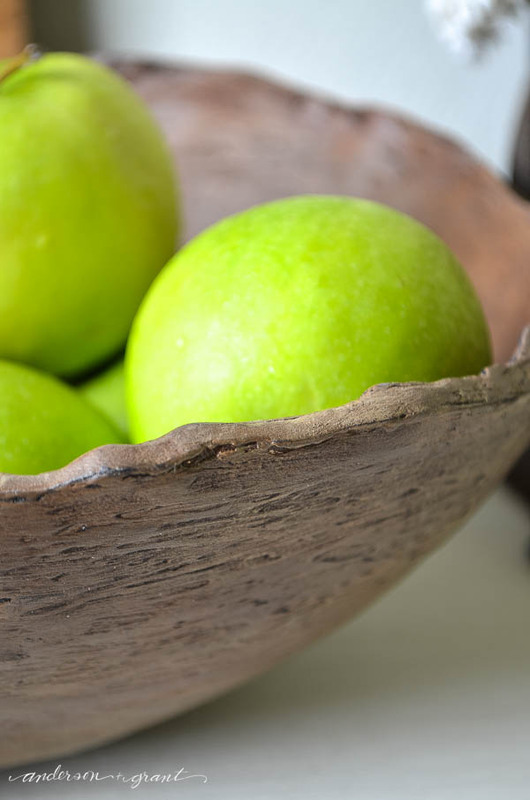 Paint your bowl a color rather than giving it the look of faux wood. 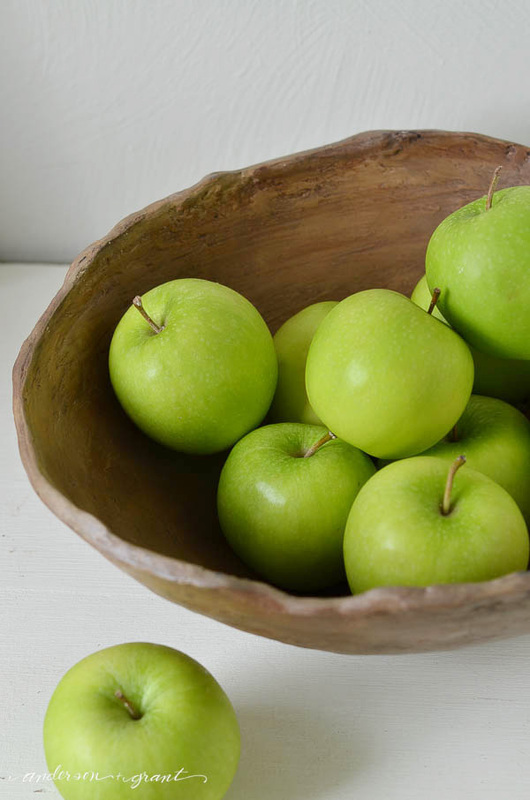 Make your bowl smooth and less rustic. Whatever you choose, just make the bowl your own in your own unique style. And have fun!